Chesterfield defender Drew Talbot has joined Plymouth Argyle on loan for three months after recovering from injury. 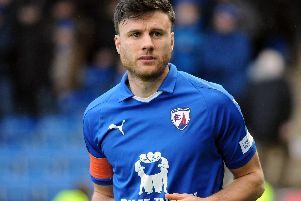 Talbot made his first appearance of the season as a substitute in Chesterfield’s game at home to Crawley Town on Tuesday night after being troubled by a recurring problem in the latter stages of last season. The deal expires on May 2, but there is a clause allowing Chesterfield to invoke a 24-hour recall after 28 days. Talbot, 29, has made over 200 appearances since joining the Spireites from Luton Town in 2009, initially on loan.